We didn't really think we should make a post of this so-called poor mans food "Kanji " or in simple plain words Rice porridge. There's nothing really that goes into making it, but the idea is new to lot of other Indians. Its then we realized its popular only down south and most of us have this comfort food when we are struck with a bad cold or one of its accomplices. * If you are using red matta rice, you will need to add more water. * While giving this to small babies/ children, add some ghee and nicely mash up the rice. Its a great meal by itself, specially when they are sick or have lost appetite. *We usually make the kanji in a open deep pot. Looking at the remaining baby shrimp from last week, we thought of all that we could make and then Alas we realized that we missed the classic recipe Cheemmen Chamanthi, a favorite in all mallu homes. So here's our very own version. All you need is a bowl of kanji or steaming rice to enjoy this mouthwatering chutney. Heat lil oil in a kadai /deep pan.Fry the baby shrimp for about 3-5 mins. Add rest of the ingredients and keep roasting it on low flame for about 5-10 mins till all the rawness goes away. Turn off the heat and let it slightly cool before you coarsely grind. Enjoy!! Here's one aromatic chutney that freshens up any of your sandwiches or chaat with its intense green flavor. * To make a smooth spread add a little sour cream to this chutney. Grind all the above ingredients to a smooth paste. Adjust salt and spice. Chutney is ready. A slight alteration in the ingredients can make a delicious chammanthi. Coarsely grind all these ingredients. Enjoy it with steaming hot rice. Avocados doesnt not really fall into the fruit category because it doesn't have a taste on its own.It needs some salt/ sugar to make something interesting of it and there are some creative recipes if you search the internet pool. Its rich smoothy pulp is said to have properties to reduce the bad cholesterol numbers. So here's a classic smoothie to say cheers to good heart and good health!!! * We used our regular low fat milk and yet it came out very creamy. Cut the Avocado in half, pull the seed and scoop out the pulp.Blend it all with sugar and milk until smooth and creamy.Enjoy it cold any time of the day!!! We are sending this entry to Healing foods event hosted by Siri's Corner. * You can also add corn kernels or any other vegetables of your choice to tweak this recipe. Mash the boiled potatoes well and keep aside. Blend the steamed carrots and cauliflower until finely shredded. Squeeze out all the water from shredded carrots and cauliflower and add it to the mashed potatoes. Heat some oil, splutter the cumin seeds, add the ginger garlic paste and saute.Add the chopped onions, sprinkle salt and add all the dry powders. Mix well. Add the saunf. Let it cool. Add this mixture to the mashed vegetables. Add chopped coriander leaves. Mix everything until the all spices and the vegetables blend in. Adjust the salt and spice levels. Valentines day fever is all over and we can't help staying out of it. To add more color and spirits to this fun day, here's a simple red velvety cake that takes hardly anytime from start to end. Even better, add a whipped cream topping with tons of strawberries. What more do you need to impress that special person in your life?? Happy Valentines Day!!! Strawberries: about 8-10 of them sliced. * We used a little less food color. However you can add a few more drops to get the deep red color. Beat sugar and butter until smooth. Add eggs one at a time and beat thoroughly until ivory. Meanwhile sieve the all purpose flour, baking powder and cocoa. Slowly add this flour mixture in little portions to the beaten egg and mix well. Add the buttermilk and mix well. Finally add the red food color and give a thorough mix until the batter is perfectly smooth. Butter a baking dish, pour this batter and bake at 350 ° F. Check to see the cake rising and turn off the oven when the center comes out clean as poke it. Leave the cake to completely cool before you turn it onto a plate. Cut the strawberries and keep aside. If they are little sour you can dust some on sugar (1-2 teaspoons) on top of it. It makes them sweeter. Then beat heavy whipping cream with a hand mixer simultaneously adding the powdered sugar until it holds firm peaks. Spread a layer of this whipped cream on the cooled cake. Decorate with strawberries. You can even add chocolate shavings for some added color. Enjoy a slice of this delicious cake on this special occasion with your loved one. Excuse the smudged whipped cream on the slice. Well, we don't know much about the origin of this dish, but we can do say that its a common item in every restaurant you can go to in South India. It is commonly referred as the "Vegetarians delight". And there is sure to be a slight variation in taste and style within these regions due to the obvious difference in inspirations. * You can use a mix of vegetables of your choice. You could also add paneer cubes. Grind the mint leaves, coriander leaves, ginger, garlic, green chillies and grated coconut with a little water to a fine taste. 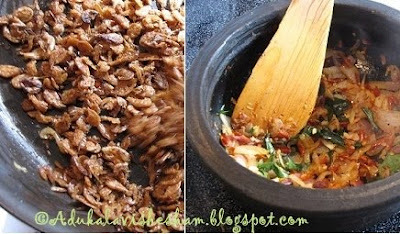 Also soak the khaskhas and cashew nuts in warm water for about 10 mins and then grind it to a smooth paste and keep aside. Heat oil in a deep pan, saute all the whole garam masala. Add a sprig of curry leaves and the sliced onions. Sprinkle salt. When the rawness of the onions goes away add the the rest of the vegetables and keep sauteing. Add the turmeric powder and the green chutney you made ahead and mix well. Keep on low -medium flame and toss the vegetables in he chutney. Add the tomato puree and the ground khaskhas-cashew paste and mix everything nicely. Add 1/4 cup of water and cover and cook until all the vegetables are soft and all the rawness of the spice have gone away. Now dilute the coconut milk with a little water, add pepper and the garam masala powder and pout in to this. Don't let the coconut milk come to a full boil. Turn off the gas just before that. Your wonderful vegetable kurma is ready to eat. Personally we like it with parathas or puris. Here's our attempt at the king of all fast food - French Fries in a non convention style. Baked to perfection with a subtle hint of garlic and chilli makes these the easiest comfort food without a big guilt of eating unhealthy. Peel the potatoes and cut it into thin strips. Sprinkle salt, garlic powder, pepper, chilli powder and drizzle olive oil generously. Preheat the oven at 450° F and bake the potato till it gets crisp. Take off from the oven and eat them hot. Important note is that these fries lose all the charm when you have it after its cooled down. We are sending this recipe to Healthy fast food event hosted by food for 7 stages of life and Sudeshna’s Cook like a bong. Here's another recipe which is a leftover transformation. Though this post/ recipe was something we were contemplating about posting it or not. Why? Because the recipe is so simple that it didn't really call for blog space. But, at the brighter side, we thought for all those people who haven't heard or tasted anything like this, its gonna be a big miss. Heat some oil in a pan, add the cut up Idlis, sprinkle salt and chilli powder and saute until it coats well on the Idlis. Once the Idlis start to slightly crispen on the sides, tear up the curry leaves. Take it off the heat. Serve hot with your evening cup of tea.